After a 20-minute walk along a gradual slope from Mito station, a spiral tower remotely shows itself between buildings in the city. As I walk toward the tower, I encounter a green scene of a grassy plaza with 3 zelkova trees in its entrance gate. Art Tower Mito is at the center of Mito city, and is popular among people around the city as “geijutsukan (center of arts)”, together with the calm plaza I mentioned above. 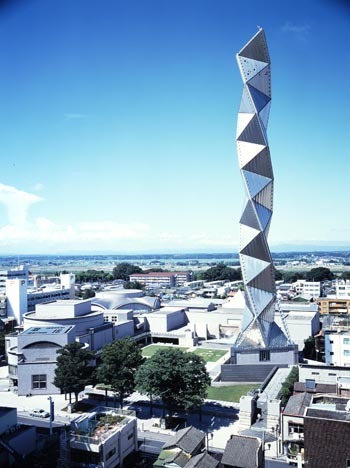 Art Tower Mito opened 1999 at Mito in Ibaraki prefecture. This art complex center has a contemporary art gallery, a theater, and a concert hall. It was built after an elementary school in the city in 1989, when the city celebrated its centennial anniversary. It was designed by Arata Isozaki. Each building is surrounded by a plaza, and a cascade ties them all together. 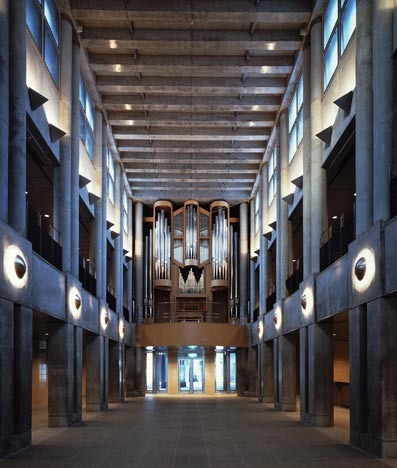 The facilities share one entrance which has one of the biggest pipe organs in Japan. The Tower is a symbol of this center. It is composed of 28 contiguous regular tetrahedron sections set on top of each other. The 57 triangular surfaces are covered with titanium panels. It’s built 100m high and has an observation deck on its top. From the deck’s round windows we can overlook Mito city. The Contemporary Art Gallery is made of bright and open spaces full of sunlight that comes from its high ceiling and top windows. It is structured by 9 different rooms and its construction and route are changeable depending on each show. The wall and the ceiling are painted white so as not to affect any of exhibitions. Not only has it held many famous artists’ exhibits such as James Turrell and Tatsuo Miyajima, it has also held exhibitions to find and introduce new artists through a series of shows called “Criterium”. When you visit “ATM Theatre”, you will be surprised because the stage and seats are very close to each other. The seats are arranged in circular fashion around the stage, and it gives the audience the feeling of being right beside the performers even if they are at the farthest from the stage. The wall is made by blue-brick, so the performers look beautiful like floating in the electric light. “Concert Hall ATM” is made for classical music concerts. Opposite the “ATM Thetre”, the hall looks light and gentle because of its white wooden wall and round shaped ceiling. The ceiling is supported by 3 giant marble columns and has a spiral sound-reflecting disk which can be moved vertically according to its needs. The city of Mito conserves many of its landmarks from the Edo period and keeps beautiful scenery of nature. At the center of this scenery, Art Tower proudly stands as an important symbol of this city.